Welcome to Glasto. The colossal summer knees-up in King Arthur country is the world’s biggest and best music festival. It’s like Woodstock, except it takes place pretty much every year. The list of performers who have rocked the venue’s muddy fields reads like a who’s who of popular music: Dylan, Bowie, Oasis, Blur, Massive Attack, Orbital, Björk, Radiohead, The Cure. And what a place to play. More than 175,000 revellers descend on 900 acres of farmland, bringing tents, 3L bottles of local West Country cider and, if it’s one of the ‘muddy years’, Wellington boots. As if following the local ley line, the atmosphere courses along the tree-lined tracks; often with more direction than festivalgoers navigating both altered states of consciousness and the route to that amazing noodle van. 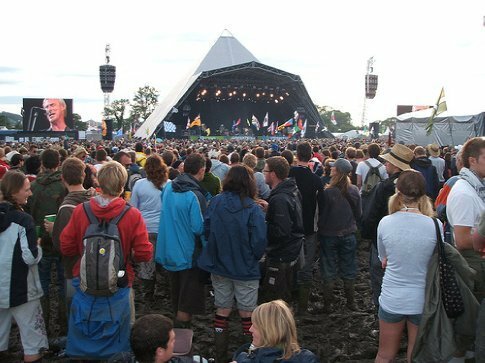 Much of the entertainment has nothing to do with the headline acts on the Pyramid Stage, which is the epicentre of a busy area nicknamed ‘Babylon’ by old hands. At the other end of the site, beyond the Jazzworld Stage, the circus and the tipi field, the Sacred Space is a focus for the spiritual, pagan aspects of the post–summer solstice event. Watching the sun rise above the stone circle in the hillside meadow is the perfect comedown from a night of electronica-powered crazy-dancing in the Dance Area or the Glade. Nearby, Lost Vagueness is a theatrical alternate reality, where you can join a mass marriage in the Chapel of Loathe or Loathe, before hiring a ball gown or period suit so you look the part in the Lost Luck Casino and Slip Roller Disco. This quarter of Glastoville also contains the green areas. Unlike many large gatherings, the festival has environmentalism high on its agenda – not least because the site serves as a dairy farm for the rest of the year. If you won’t let anything as trifling as a roller disco drag you away from your beloved music, Glastonbury might make you feel like a pilgrim arriving at a temple. By catapulting scores of bands to fame, it has shaped 35 years of musical history. One such band is The Smiths, booked in 1984 on the recommendation of the late, great DJ John Peel, who now lends his name to the new bands’ stage. Critics accused organiser Michael Eavis, now a CBE (Commander of the British Empire), of selling out when he recruited the Mean Fiddler group to help in 2002. Certainly, the tightened security has altered the tone: tickets now bear holders’ faces. Offerings like the Paradise Lost Trailer Park, which has a butler service and Can Can dancers, are a far cry from the festival’s uncommercial, rural roots. But Glastonbury had to evolve. It was in danger of imploding, in the manner of the old Isle of Wight Festival, and anyway, the hippies who used to jump the fence have found a new way in as stall-holders. Local Attractions: Can’t deal with consensus reality after a long weekend at Worthy Farm? Climb Glastonbury Tor for a 360° view and yet more King Arthur associations. Travel Safety Tips From The World Nomads Safety Hub: Yes, Glasto is certainly the King of festivals, and while it's uinhinged grassroots may have disappeared, and it's security beefed up, like most festivals, it's still a relatively volatile place to be. The teaming mass of humanity is the first thing you need to deal with. The logistics may be hard, but always try to travel around the festival with at least one friend. This way, if you get lost in the mosh-pit at Babylon, at least someone will know you are gone - and your mates come in exceptionally handy if you take a tumble in the thick of it. Next, watch out for dodgy geezers. Glasto is full of fun loving friendly folk, but just like Cat Stevens sang - "...just remember there's a lot of bad and beware"
Again, safety in numbers - especially the case for girls. Let some dodgy bloke spin his magic around you, and you could be at risk of a drink spike. Which much easier to let happen when you are in a festive atmosphere. Just keep an eye out. Speaking of spiking, we have to brace the elephant in the room - illicit drugs. It goes on, and despite the efforts by police and security to stop it, it's probably not going to go away any time soon. Legality aside (and we in no way condone the use of illegal drugs) all we have to say is this - if you take any kind of drug, you put yourself into a vulnerable position and could compromise your safety, especially at an event that holds 175,000 people. So don't lose your head - with such a great line up you shouldn't even need drugs to have a good time.